What's special about Vines Storage than other Storage Facilities? 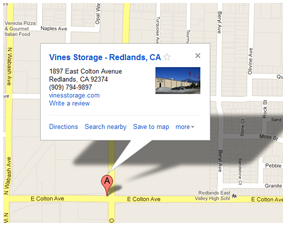 Vines Storage of Redlands, CA is an amazing self-storage facility that offers everything you could ever need. From great amenities, an enclosed, secured facility, and spacious self-storage units, Vines Storage has it all! Vines Storage has a number of benefits over other area storage locations. For RV storage, the amenities at Vines Storage are unbeatable. We offer purified and filtered water, ice, compressed air, and a waste dump station included in your lease, and offer additional services (for a fee) such as RV cleaning. Additionally, we sell boxes and tape for customers to make their move simple and easy. No other facility in the area can match the amenities and services that we provide for our customers. From RVs to boats, we store a number of vehicles for our customers. We provide the option for indoor and outdoor self-storage, giving our customers control as to what they are looking for when it comes to their storage area. Costs vary depending on the location chosen in our facility, and we will work with you to help you decide what situation will work best for your storage needs. Self-storage is easy when it comes to our large, spacious units. Our facility was remodeled from an existing warehouse, which means that our units are taller than other area self-storage facilities. This means more storage per cubic foot than any other storage facility in the Redlands, CA area. We have a 32-camera video surveillance system installed at our facility for 24 hour monitoring, and offer convenient access hours with on-staff assistance. We ensure that your property is safe and protected at our facility; however, we do recommend that customers consider extra insurance for their storage area. Vines Storage offers both short-term and long-term leasing options, as well as month-to-month rental considerations. We have a storage unit for most any budget! If you are looking for a safe, reliable, and convenient self-storage facility in Redlands, CA, call Vines Storage today and learn more about our self-storage units and leasing options.